My boys and I have just started going through this Bible – one story at a time. I have to tell you, so far, I am in LOVE with it. 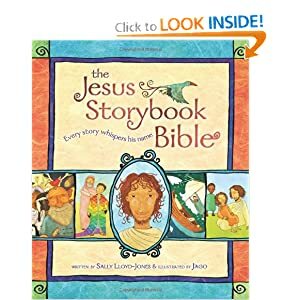 It passionately depicts the stories of the Bible, remaining true to Scripture but using a prose that appeals to children in a Dr. Seuss type rhythm. The illustrations are gorgeous drawing you in and artistically telling the story alongside the words of Sally Lloyd-Jones. My boys eagerly listen, their eyes growing wide with stories of God’s majesty, His incredible creations and His never-failing love. That is exactly what I want for my boys. I am so grateful when I find items that help me encourage a love and hunger in them for God-things and not more stuff. Amazon has a great deal on this book right now – $10.33 for the hardback version that we are using. It also qualifies for FREE shipping with a $25 purchase.